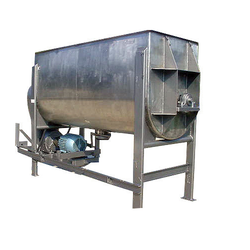 Manufacturer of a wide range of products which include ribbon blender. We are one of the top most manufacturers, exporters and traders of Ribbon Blender. This blender is commonly used for effective mixing of different materials and used in various industries such as chemical, food and pharmaceutical. Manufactured from optimum quality raw materials, our product is known for its sturdy construction and excellent performance. With the help of our dedicated logistic professionals, we have been able to deliver our goods in fixed time constraint. Looking for Ribbon Blender ?